Nothing beats a wedding in Philadelphia. Take one look at these photos and you’ll see why! Victoria and Thomas shared a picture perfect wedding day as they visited some of the most noteworthy spots throughout Center City. There were SO many special, and scenic moments to document, which is why we are thrilled our friends from Philip Gabriel Photography were also a part of this day! The fun started early in the morning, as the bride and groom prepared for the ceremony. It was wonderful to watch Victoria’s dad see her in her gown for the first time! The whole morning was filled with smiles, from Victoria’s reaction to her bouquet, to Thomas enjoying a quiet moment reading a note from his future wife and receiving a beautiful new watch. These are truly once in a lifetime moments that we know Victoria and Thomas will not soon forget, especially since the Allure Films team was there to document the whole thing. 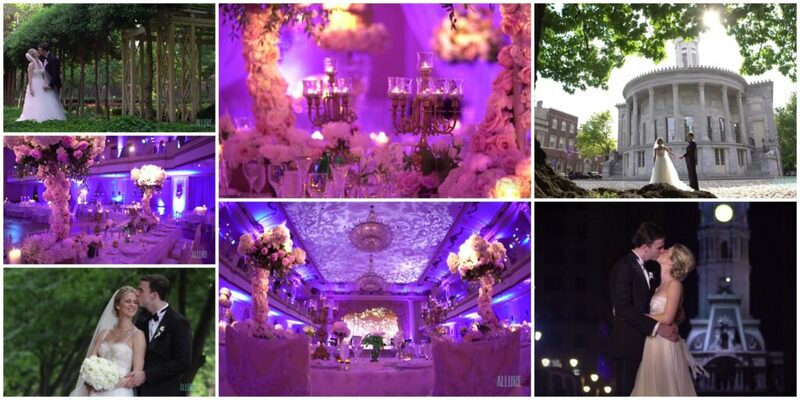 Victoria and Thomas said their “I do’s” at St. Patrick’s Cathedral in Rittenhouse Square. The Rolls Royce that brought Victoria to the cathedral was gorgeous, but not nearly as stunning as the blushing bride! After the ceremony, the couple made their way to the Hyatt At The Bellevue, stopping along the way to vist some of the city’s most historic spots and romantic gardens. Everyone’s jaws dropped when we first set foot in the Hyatt. With stunning décor by Lamsback Floral Decorators, the backdrop for the rest of Victoria and Thomas’ evening was truly a sight for all to see. The evening was spent enjoying fine food, a fantastic couple, and incredible music by one of our favorite bands, as our friends from Jellyroll did a phenomenal job keeping all of the guests on their feet. What’s not to love? Click here for more information on wedding videography packages by Allure Films.